GLOBAL AIR CNPF1018 - Unive...minum O-Ring #6 & #8 10" X 18"
BANGALORE/NEW DELHI: Taxi hailing app Uber which made a splash last year debuting with a squadron of BMWs, Mercedes’ and Audis appears to have dropped these luxury cars from its fleet and is instead focusing on adding more Innovas and Corollas. The company launched operations in India last year with its luxury segment, Uber Black, in cities such as Bangalore, Delhi and Mumbai. However, it has scaled down its luxury fleet. 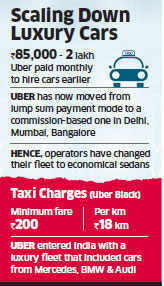 In cities such as Bangalore, Uber has almost entirely moved payment for its luxury vehicles to a commission basis from a lump sum at the end of the month. This has made operators move their fleet to economical sedans than an Audi or BMW, which are costlier to run. In Delhi too, Uber has moved its Uber Black drivers to a commission basis. Luxury cab operators confirm this development. “When Uber entered India, they used to hire our luxury cars like an Audi or BMW for on a monthly basis for anywhere between Rs 85,000 to Rs 2 lakh per car,” said the founder of one of the biggest luxury car operators in Bangalore on condition of anonymity. “In a few months, they asked us to move to a commissionbased model. As the rate was very low, we decided to stop services.” Uber charges Rs 200 as the minimum fare followed by a rate of Rs 18 per km for a Uber Black cab. Two Uber employees confirmed the development. However, Uber officially declined to comment on the story. “We have moved to 100% commission basis in Bangalore for Uber Black. In other cities such as Delhi and Mumbai, the fleet of luxury cabs such as Audi is reduced as we have added more Innovas,” said an Uber official on condition of anonymity. Several frequent Uber customers told ET that they have not been picked up in an Audi or a BMW for as long as six months. “Now all I get is to travel in cabs such as Toyota Innova or a Honda City, and I travel by Uber almost every other day,” said a Bangalore-based entrepreneur. Marketers feel that it will be difficult for Uber India to gain that upper class brand positioning again. “Downgrading a brand offering is a letdown for the upwardly mobile customers who will be difficult to regain,” said Ambika Sharma, founder and MD of Pulp Strategy, a brand activation company based in Delhi, which works with clients such as Microsoft and Intel. “It is advisable for luxury brands to create a lower segment while maintaining existing customers at higher prices, just as companies such as Burberry have done,” Sharma added. According to sources, Uber spends about Rs 1-5 crore on launch in a new city in India and the offer of a premium vehicle like a BMW is just to create a brand in the minds of the SEC A customers. This market entry strategy of Uber has peeved luxury cab operators. Bangalore based Shrusti Travels, which offers luxury cars on rent, had partnered with Uber when the global luxury car rental aggregator had launched its service in Karnataka. However, the association did not last long. “We worked with them only for four months. Our working styles and requirements do not match,” said a manager at Shrusti, who did not want to be named.